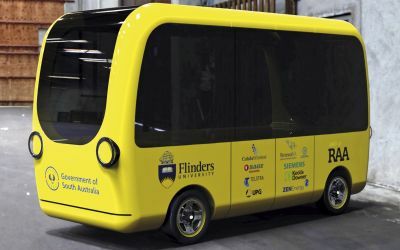 Flinders University will receive up to $1 million of Future Mobility Lab Funds for a five-year, three stage, $4 million driverless last mile shuttle project - for which Flinders University and the RAA have partnered with industry supporters Cohda Wireless, Renewal SA, SAGE Automation, SIEMENS, Telstra, UPG, ZENEnergy and public transport operator Keolis Downer. Navya’s ARMA electric shuttle, which can carry up to 15 passengers, will propel the Flinders Autonomous Shuttle Trial (FAST) at the Tonsley Innovation Precinct. Initial trials will focus on putting driverless shuttles on to public roads within the Tonsley precinct and connecting them to bus stops on South Road and the Clovelly Park train station. A mobile app will enable people arriving by bus or train to Tonsley to book a shuttle to meet them and take them to any business destination within the Tonsley precinct. Future stages to extend to the Bedford Park campus and other local public transport hubs. The vehicle will be docked within a six-bay solar re-charging garage, constructed near the Mitsubishi building on South Road, which will also be available for Flinders University staff, students and the public to recharge their electric vehicles for free, as part of an awareness campaign to promote carbon neutral transport options. Flinders University will also utilise the trial to research the public’s acceptance and response to driverless vehicles.